Let the ol’ girl go? – HubNut – celebrating the average! Let the ol’ girl go? Is it time to bid farewell to the BX? You are looking at possibly the best car in the world. It has the ride comfort of a Rolls-Royce, the practicality of a small van, the quirkiness of a true Citroën, easy motorway cruising yet also 50+mpg. It was stupidly cheap to buy, and despite what people believe, really quite simple. And I’ve decided that I no longer want it. The problem is, I do rather tend to get bored of cars, and am always seeking something better – or at least different. Hence why I find myself wanting to get rid of probably the best car I’ve ever owned. 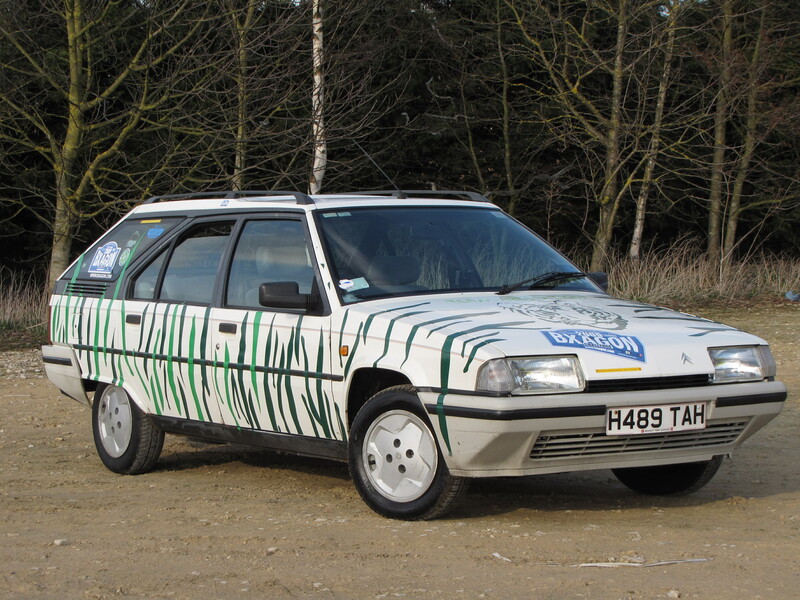 I bought the BX in September 2009, primarily to take part in the BXagon Rally – a drive around the circumference of France to raise money for Cancer Research UK (hence the tiger stripes – well, you’ve got to look the part). It covered the 3500 with aplomb and I liked it so much that the car remained on the fleet, clocking up 20,000 miles in my ownership this week. That’s a total of 162,500, but you wouldn’t really know it. These cars eat up miles. In that time, I’ve used it on my daily commute, towed car trailers with it, filled it with stuff when moving house, collected a new oven and a new washing machine, driven it around Scotland, Wales and the South West of England – as well as through parts of Belgium, Luxembourg, Switzerland and Spain on that epic trip around France. It cost £266 to buy, and that included tax and MOT. I’ve since probably spent £1000 on upkeep – including a pair of brilliant Hankook tyres, a hydraulic flush, the odd pipe repair, a new rear axle arm bearing and basic servicing. That’s cheap motoring in anyone’s book. So, it’s bloody good at everything, costs pennies to run and garners attention like nothing else. It is the curse of the car enthusiast with wide tastes that I now want to sell it. Yes, it’s good, but it’s not ‘something else’ anymore. £300 anyone? Then I’ll go and buy something completely impractical, that will cost a fortune to run. With a £300 budget. Should be fun!